Would You Spend Five Months at Sea? If I was asked this question my answer would be positive for sure. Still, the second thing that comes to mind is – under what circumstances. Is it a cruise? How many stops are we making in five months? Is it non-stop sailing? Which area are we about to sail? Yes, there are so many sub-questions about sailing that appear after the initial thrill! This is a story about five month of mostly unplanned sailing. And this is a true story. Earlier this month I received a link to interesting news about salvage of two ‘fishermen’ from Papua New Guinea. 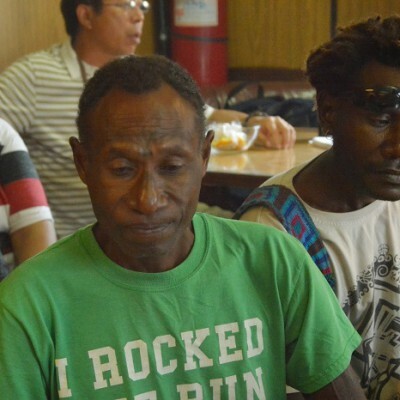 Michael Bolong (54) and Ambros Wavut (28) decided to take a fishing trip and took off shores of New Ireland, W Papua New Guinea in early July of last year. Somehow the engine got stuck and they were not able to repair it – partly due to the lack of knowledge and the lack of tools. The first days of their ‘cruise’ they encounter a few large ships but they were not able to attract their attention because they did not have any communication or pyrotechnic devices aboard.They took off aboard a small open fishing boat not bigger than 6 m, equipped with basic fishing tools, some water, wearing nothing but shorts, t-shirts and baseball caps. They did not intend to spend more than one afternoon and perhaps night at sea. Furthermore, the currents drifted them up north, off shipping routes so the chances to get help from a liner or merchant ship were down to minimum. The two unfortunate sailors managed to survive by eating raw fish they were constantly catching. The bigger problem was the thirst. They were lucky with multiple storms which brought them enough water to survive, while the fact they saved their boat from capsizing was pure luck. About five months after Bolong and Wavut left their homes they were found by a local fishermen close to the shores of distant atoll Kapingamarangi which belongs to the state of Pohnpei of the Federated States of Micronesia. Surprisingly, Bolong and Wavut were saved in good health condition, if we exclude sunburns and general exhaustion. At the end of the post I would just like to mention one interesting fact – Bolong and Wavut are bricklayers by their profession.Just to summarize their trip – they drifted some 1000 NM in the open Pacific Ocean for five months without meeting any other boat, yacht or ship. Unfortunately, their friend Francis Dimansol (48) who was the third crew member did not make it to the Kapingamarangi. He died two weeks before the other two were saved, believing they were forgotten by everyone but their families.